Regrettably within the licensed trade “friends pints” and pilfering can pose a significant problem. BeerTech are now solving this problem instantly with a low cost system that allows you to match pints sold in the till with pints poured from the kegs. 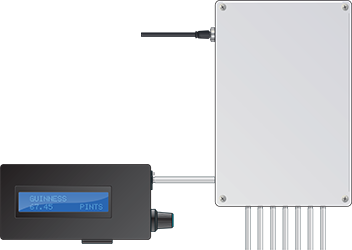 The BeerTEckTronics MKIII Flow meter system incorporates high resolution flow sensors connected to two microcontroller based hardware units allowing up to 12 beverage flow lines to be monitored and the data instantaneously processed and stored. Located in a central location in cellar close to mains power supply. Supplied with power from mains supply via D.C. adaptor. Single output cable supplies data and power to display unit. Located in convenient location within building. LCD display shows date, time and totals, and acts as user interface. Receives data from sender unit, processes and stores it. The accuracy of the displayed quantities dispensed and totals are maximised by first processing the raw data from the sensors. The data stored on the memory card can be read on a shift, daily, weekly, monthly or even yearly basis or simply be looked at if needed. Counters can be reset every shift / barrel / day / month etc. Memory card is read using excel or similar where data can be viewed and examined. Further processing can be done within spreadsheet if desired. Secure entry to system by means of 4 digit password. Automatic retrieval of totals following power cut. Individual calibration of all 12 sensors. Ability to pause system to allow line cleaning without affecting beer totals. The memory card file could also be e-mailed to any other location for examination. This is a programmable system so bespoke tailoring of the system is possible by means of software changes without altering the hardware. The installation carries a cost of £180.00 per cellar. The system comes with a one year warranty, after which this can be extended.